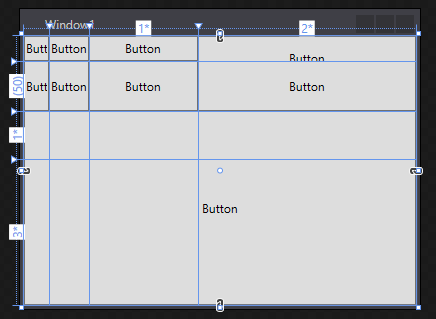 Windows Presentation Foundation (WPF) has the called Panel controls. Those are controls that can contain a set of child controls. 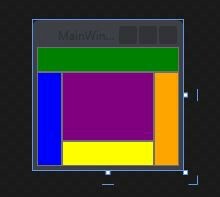 Each Panel has its own particular way of organizing controls. Panel controls are everything that derives from System.Windows.Controls.Panel. Their main purpose is to group a set of controls in a container. Note: This post doesn’t cover Ribbon Panels, but basically they are all the panel types that compose a ribbon bar. The Canvas control allows you to add controls to any position on the screen by informing the coordinates. This is the control you want when developing a game, because you can draw on it. The DockPanel control can define where elements will be docked within it. We can specify where the elements will be docked by setting DockPanel.Dock to the position where they should be docked. If the element is inside the DockPanel and is not specifying a position it is going to use the remaining space. The above code will result in the image bellow. Notice that elements docked last have less space available to them than the elements docked first. The Grid control allows you to define rows and columns by creating ColumnDefinitions and RowDefinitions. You can set their size to a number of pixels, Auto (which means resize itself to the contents occupied space), "" or "N" (* = give me what is left; 2* = give me two pieces of what is left; 5* = five pieces of what is left...). And then to place the controls in their respective rows and columns you add Grid.Row="X" and Grid.Column="Y" to the controls tag. You can also set Grid.RowSpan and Grid.ColumnSpan to occupy more rows/columns. The TabPanel control is the control used internally by the TabControl to contain the set of tabs. The ToolBarOverflowPanel control is used internally by the toolbar to handle overflow of items. When there are more items it can show the extra content is added under the arrow button. The VirtualizingPanel control is an abstract control. The types deriving from it can set IsVirtualizing to true indicating the control will only draw the controls in the screen that can be visible. The other elements aren't rendered unless you scroll them into view. The WrapPanel control can be used to handle wrapping when the contents of the panel go over its size.